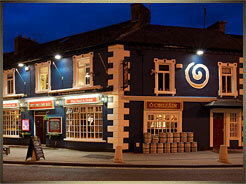 Adare is the perfect setting for a wedding in Ireland, known as “the wedding capital of Ireland”. The village offers a historic and tranquil setting. The Catholic church is the second oldest in Ireland that is still in use today and lies opposite the thatched cottages that line the streets. Next to the cottages is the Village Park that was given to the people of Adare by the Dunraven estate many years ago, giving you the perfect photo opportunaties, making this the perfect wedding venue. At Pat Collins Bar we have catered for pre and post wedding paritesthrough the years as those travelling get a chance to meet up before the wedding or a last chance to wish the bride and groom luck before leaving Adare. We can cater for small and large groups with set menus or finger food. If you would like music for your party contact us.